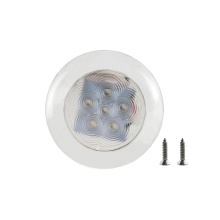 1pcs of energy efficient and attractive LED round light with white plastic housing. It is ideal for interior and exterior lighting applications, 6 LEDs provide bright enough lighting, meet your different requirements. This light can be recessed mounted or surface mounted by attaching 304 trim ring included. Made of premium quality material, 304 stainless steel trim ring and PC housing, stable and durable for a long time use.